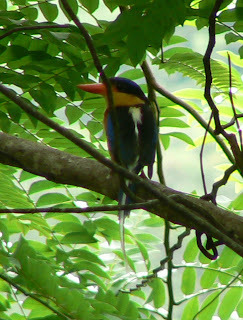 Daintree Valley Haven: RETURN OF THE KINGFISHERS! At last the magnificent Buff-breasted Paradise Kingfishers have returned after their winter migration - we have yet to see one but at dawn this morning we heard the first of their distinctive calls. I'll go for a walk round later and hope to spot one - usually all you see is a flash of their long white tails as they zoom across the track in front of you. Last year we saw the first one on 8th November so they are about a week earlier this time. This is a distant shot of one which I took last year. Now we'll keep an eye on all the termite mounds where they have nested previously. Interestingly they will only return to the mounds which have since been 'repaired' by the termites - must be to ensure a constant food supply! Hi Barb - thank you for commenting! It was fantastic to catch up with you and Chan again - hope it won't be too long before we get together again!